Ok, with a title like that, you’ve got to be curious, right? Is it really possible to use spices like cayenne powder and ginger to keep warm? Well, I’m happy to tell you that yes, it is possible. It’s frugal, it’s natural, and although it’s a bit unorthodox, it works. The whole idea came from someone you long-time readers probably know all too well: Renaissance Ronin. He loves lurking around leaving funny comments here at The Greenest Dollar. He’s a good friend of mine, and chock full of really interesting, useful information (although don’t tell him that- it will just go to his head). Anyway, he was telling me about how when he was growing up, his mom had some frugal ways to keep him warm during the wintertime. EUREKA! A few personal stories, a little research, and a blog post is born. 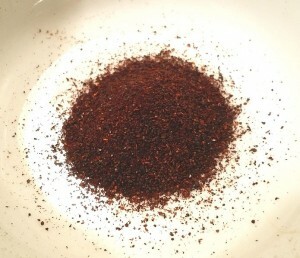 After hearing Ronin’s cayenne powder and ginger stories, I hit the web to see if anyone else had used chili powder to keep warm. And I was really surprised at how much information was out there. Apparently I’ve been living under a rock, because this seems to be a fairly established remedy. Sprinkle it on your hands and feet and then cover with gloves and socks before going outside. I found this interesting forum thread from skiers who all swear this works great when they go out for a day of skiing. Drink ginger tea. I can personally attest that this one works, because ginger tea is one of my favorites. To make it, just buy some fresh ginger and shave about 2 Tablespoons off into thin strips. Soak the ginger in hot water (with a tea ball or without) for about 5 minutes. If you can use a spoon to “crush” the ginger in the water you’ll get more spicy flavor. This also works really great when you have an upset stomach, or if you have a cold with chest congestion. Eat ginger candies. Even Altoids makes these now. Spicy, but they’ll get your blood flowing! The Huffington Post reports that cinnamon candies are great for keeping warm. Cinnamon is a member of the Laurel Family of plants, and helps improve circulation. You can also sprinkle cayenne pepper into your hot cocoa for an extra kick. Now this may sound gross but it’s really not. I love Mexican Hot Cocoa (which has cayenne pepper in it). It’s delicious! If you’d like to make some, here’s a great recipe from Epicurous. YUM times 12. Cinnamon in your oatmeal or on your toast is also a good way to stay warm. My favorite oatmeal is crock-pot steel cut oats, and you can see my recipe for that here. Yum again! So, how does chili pepper keep us warm? Well, Native Americans have long known about the health benefits of chili. Doctors think that the main ingredient, capsaicin, helps stimulate nerves and blood flow. Which, in turn, makes us feel warmer. The cool thing about chili pepper is that it can do a lot more for us than just keep us warm. What about you? Do you use any of these remedies to stay warm? Do you have any I haven’t mentioned? If so, I’d love to hear about them and share them with other readers! That’s so interesting. I’d definitely never heard about sprinkling cayenne powder on feet! Even though I know spicy meals can be warming, I had never considered cayenne or ginger specifically to help warm up. Great tip. I use just powdered ginger in my socks, I learned about it just this year. No more cold clammy feet, ever! Even in cotton socks, my feet stay warm all day in our cold house and outdoors in the snow. And since my socks don’t get all sweaty and stiff, they wash better. Also, if my feet get wet outside (snow down the sides) with the ginger in my socks, my feet are still warm. So much so that when I come in, I don’t always remember to change my wet socks for dry ones.